passengers arriving at Amber Cove in the Dominican Republic! Iguana Mama, the first Adventure Tour Operator to be licensed in the Dominican Republic has been guiding the 27 Waterfalls of Damajagua tours for over 20 years and ... we are the only operator that takes you all the way to the top. Compare our Damajagua Waterfall excursions with Carnival Cruise Line's 7 Falls. We think you'll appreciate the differences including more thrills and a delicious Dominican lunch with unlimited local rum drinks included. 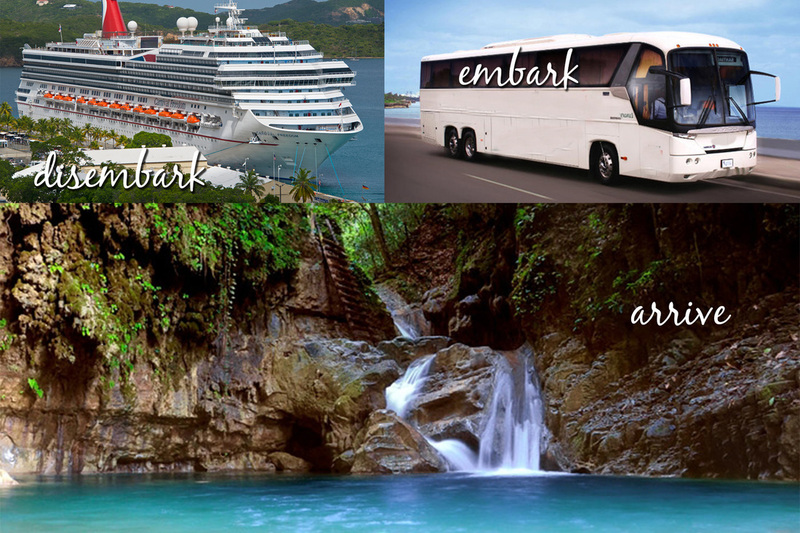 Iguana Mama is proud to offer the ultimate independent adventure shore excursions! The unique and unmissable 27 Waterfalls of Damajagua are the north coast's number one tour and a truly amazing experience. Take an unforgettable trip to nature's own perfect water park! 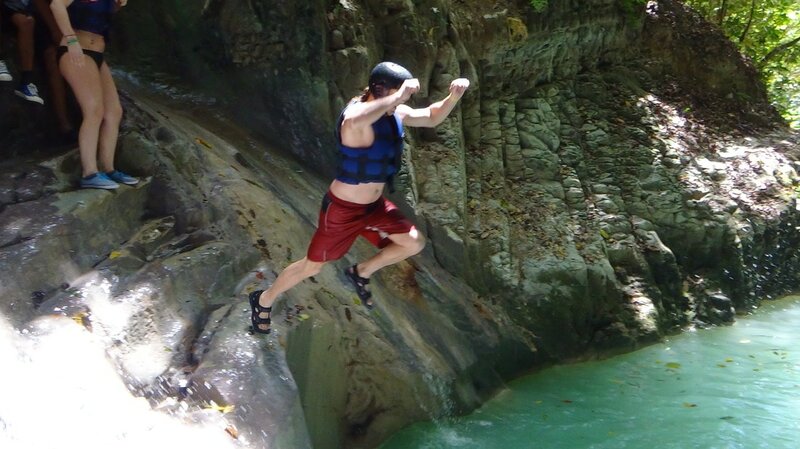 Just a short 25 minute transfer from Amber Cove Port this trip is undoubtedly one of the top ten things to do around Puerto Plata and arguably the Dominican Republic’s NUMBER ONE attraction for adventure seekers! We are locally based with over 25 years of experience taking people to Damajagua and as the Dominican Republic's first licensed Adventure Tour Operator, Iguana Mama feels uniquely qualified to offer an unrivaled "off the beaten path" experience. MIDWAY 12 WATERFALLS: Recommended for adults and children 8+ years old in fairly good physical shape. On this tour you'll hike approximately 40 minutes then slide, swim and jump your way down 12 spectacular waterfalls, canyons and river rapids. FULL 27 WATERFALLS: Recommended for adults and children 8+ years of age in good physical condition as you will be hiking approximately 70 minutes to the top of the mountain before sliding, swimming and jumping your way down all 27 thrilling waterfalls, canyons and river rapids. 7 FALLS & 8 ACCT CERTIFIED ZIP LINES: Recommended for adults and children 8+ who are in relatively good shape and love adventures! The hike up to the 7 Falls is approximately 30 minutes then slide, jump and swim back to base camp. A quick lunch and off to do 8 exciting zip lines! And adrenaline filled day. MEETING POINT: Pick up is from outside the MAIN GATE of the terminal entrance up by the highway. As ours is an INDEPENDENT tour, Carnival will not allow us to pick up inside the terminal. Once we receive your booking we will send you a receipt and confirmation including detailed instructions and a map of how to get to the meeting point. It takes approximately 12-15 minutes to walk there from the ship. We aim to depart for the falls 45 minutes after your ship docks so please make your way to the meeting point as quickly as possible. We use private buses with A/C, not open trucks. During the 25 minute ride you will receive some local information of interest from your guide. Complimentary water, sodas and snacks available on board, some buses even have free Wifi. ​On arrival at the 27 Falls of Damajagua Park you should be wearing board shorts, lycra or a T shirt and tennis shoes that can get wet. We strongly recommend women wear shorts over bathing suits.. You can safely leave a bag on the transport with personal belongings plus towel, dry clothes and flip-flops for after the tour. On leaving the bus you will receive a bottle of water for the hike and be issued with a life jacket and helmet. From this point on everything will get wet so please only bring waterproof cameras. We also offer a photo and video service so that is available to purchase after the tour. Back at base camp you will change into your dry clothes before enjoying a buffet of typical Dominican dishes plus water, sodas and local delicious rum! An old pair of running shoes, swimwear and a T Shirt that will get wet plus a towel. and change of clothes/footwear for after the tour. We recommend women wear shorts over the top of swimsuits for protection on the slides.. Water, Sodas, snacks, lunch and rum after the tour included.